Lead Actress in a Play: McKenzie Fink as Millie in Nooses Off! Lead Actress in a Play: Sonya Brieske as Lily in Nooses Off! Lead Actress in a Play: Erin Slane as Sammy in Nooses Off! Carlsbad High’s National Youth Arts Awards 2014-15: Eight Awards, Plus 9 Nominations! 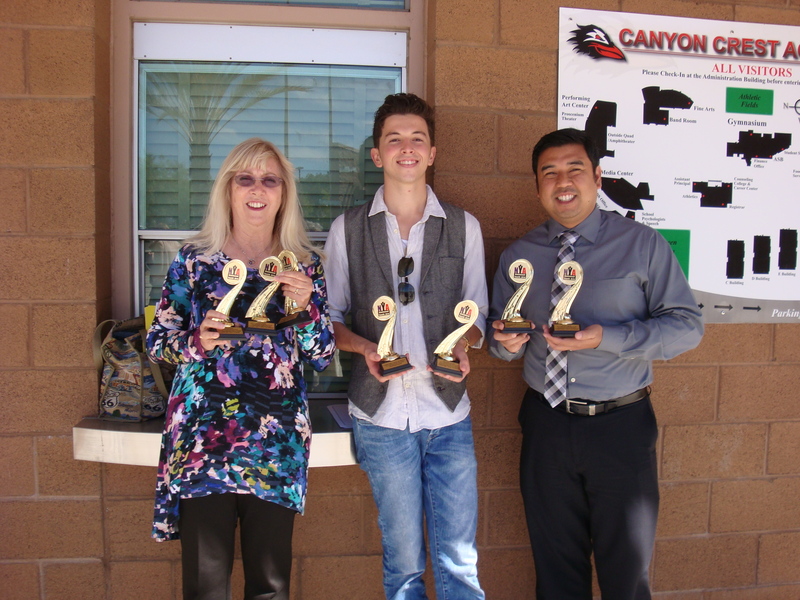 The Tenth Annual National Youth Arts Awards for the 2014-2015 were celebrated on July 12 at a ceremony at Canyon Crest Academy. Maximilian DeLoach performed “Unchained Melody”, Harrison Schwartz and Maximilian DeLoach accepted their awards, and Carter Knight and Kaylen Lash spoke for the Outstanding Ensemble. Mr. Pugeda gave a heartfelt speech in accepting his Musical Direction Award, and Mrs. Hall accepted her Directing Award as well as the Lighting Design Award for Justin Smiley. There will be an awards ceremony held at Mt. Carmel High School in San Diego at 7:30 p.m. (registration beginning at 6:45 p.m.) on Monday, July 14. Award winners, including all cast members of Ensemble awards, will be invited up to the stage for the presentation of the award. Nomination certificates will be available at the registration table for all individual nominees. Anyone who wants to attend and all performers will need to RSVP so that NYA will know if they will be there and how many people will be attending. There is an RSVP form located at http://www.nationalyouththeatre.com/news/news_nya_awards2014_rsvp.asp. Award winners and nominees get 1 free ticket for themselves (as do participants of an Outstanding Ensemble or Production award). Additional tickets are $15/each. To see the full list of winners, click on http://www.nationalyouththeatre.com/news/news_nya_awards2014.asp.